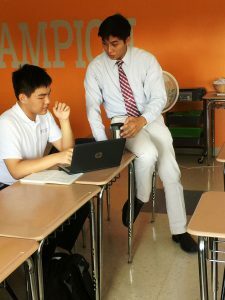 Established at Providence College in 2001, the PACT Program is a unique teacher education program that invites recent graduates to contribute two years of service as teachers in Catholic schools in New England. PACT is a proud member of the University Consortium for Catholic Education (UCCE). PACT members teach classes in language arts, English literature, British and American literature, history, biology, chemistry, physics, mathematics, Spanish, religious studies, and other subject areas. They also coach sports teams, act as advisors to students, and are leaders of school retreats. Arts and Sciences graduates with a major (30 credit hours) in English, foreign languages, history, math, biology, chemistry, physics or theology, study toward a Providence College Master of Education (M.Ed.) degree and teacher certification as a secondary school teacher, in a program approved by the State of Rhode Island, which is reciprocal with other states in the United States. Education graduates, who already possess teacher certification, follow a Master of Education program in Literacy, School Administration, History, or Mathematics and teach in elementary, middle, or high school. If your undergraduate major does not correspond with those described above, but you are still interested in PACT, please contact the PACT office. Top of Page: PACT 15 Teachers at Ruane Hall, Providence College.